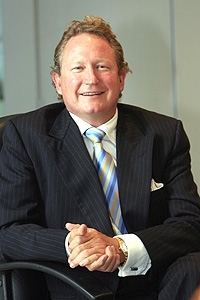 Mining magnate Andrew Forrest announced Australia's biggest philanthropic donation, a cash gift of $65 million to fund research at five universities. The historic donation is integral to efforts by Mr Forrest, the chairman of Fortescue Metals Group, and his wife, Nicola, to give away most of their $5 billion fortune under the Giving Pledge commitment launched by US billionaires Bill Gates and Warren Buffett. As part of the donation, a new $50m Forrest Foundation will be set up to fund scholarships and postdoctoral fellowships at UWA and WA's four other universities. The goal of the foundation, which is inspired by the success of the Rhodes scholarship and the Gates Cambridge scholarship, is to attract the brightest young minds from around the world in a bid to establish Perth as a global knowledge hub. The remaining $15m will be provided to build Forrest Hall, a "creative living space" for rising research stars that is intended to rival the best residential colleges in the world.